Whole, uncut, good quality rockmelons are firm and free of blemishes. Look for melons with no cuts or sunken spots on the surface, and an even netting around the entire melon without any “bald” patches. The rockmelons grown in Australia today do not have an aroma, so smelling the base of the melon will not indicate whether it is ripe. Cut melons should have a firm seed cavity and uniform orange-salmon coloured flesh, not pale, without soft spots in the flesh. There should be a definite line between the orange flesh and the green of the skin. If not, it means the melon was harvested when it was immature. An aroma will be present with cut melons as the flesh has been exposed. 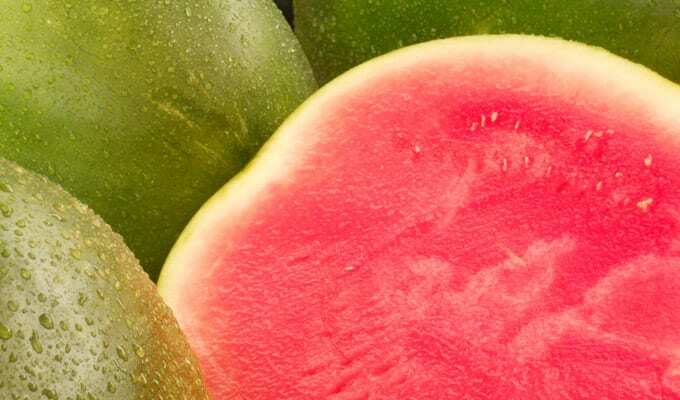 Whole, uncut good quality watermelons are firm and free of blemishes. If the part of the watermelon that was sitting on the ground, is distinctly white or yellow then the watermelon was picked when ripe. When tapped with a finger they have a sharp ring. Cut watermelons have a solid flesh with a uniform crimson-red colour. Occasionally very tiny white or black seeds may be present in seedless watermelons. In winter the flesh may be paler than in summer. White/cream honeydew melons should have smooth, waxy skin, immature fruit feels hairy. Some varieties have a slight aroma. The stem is clipped close to the fruit. The flower or blossom end of the honeydew melon (opposite the stem end) gives very slightly when light thumb pressure is used. If it gives a lot, or has a strong aroma, the fruit is overripe. Golden or yellow honeydews should not be pale yellow.